Jakarta - Toyota Indonesia has successfully managed to maintain its consistency as the largest automotive investor and exporter in Indonesia. In addition, compliance with the applicable regulations, business information and data report on time with the schedule and contribution of investment and export-import activities, have brought PT Toyota Motor Manufacturing Indonesia (TMMIN) as the winner of the Best Foreign Debt Management category and the Best Statistics Respondents from Bank Indonesia. Besides that, TMMIN was also nominated as the Best Foreign Exchange Contributor. These two awards were handed over by Bank of Indonesia's Governor Perry Warjiyo to the President Director of TMMIN, Warih Andang Tjahjono at the 2018 Annual Meeting of Bank Indonesia (PTBI), Tuesday November 27 2018, located in Assembly Hall, Jakarta Convention Center. The Best Foreign Debt Management award is given to corporations that consistently adheres to the implementation of the prudential principle in their financial management, supported by consistent application of hedging to foreign loans obtained so as not to disturb the stability of foreign exchange. 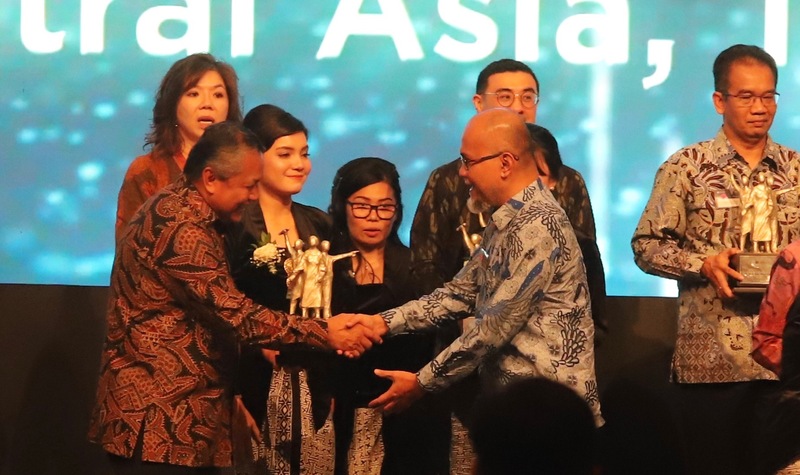 While the Best Statistics Respondent award is given to corporations that consistently provides a set of complete real-time data and information, to support the implementation of Bank of Indonesia Liaison surveys and activities, for excellent Bank Indonesia statistical compilation. Previously, TMMIN also received award for Compliance of Exporters Reporting on Export Foreign Exchange Results in 2015. "This award proves Toyota's commitment to provide more tangible contributions to the development of the Indonesian automotive industry, while at the same time affirming that the automotive industry deserves to be a national superior industry sector, mainly through investment and balance of trade maintenance activities through export activities," said Warih Andang Tjahjono. TMMIN's export performance, with its positive trend in the past 5 years, has had an impact on Toyota Indonesia's balance of trade. In the period of 2014 to July 2018, the TMMIN's balance of trade recorded net exports of approximately USD 2.9 million (or around 43 trillion rupiah). The positive balance of trade in the downstream sector still leaves homework in the world of the national automotive industry. The balance of trade in the upstream sector of the automotive supply chain, especially at the supplier level of the second and third tier components, is still negative. One of the causes of this problem is that there are still many raw materials for the automotive manufacturing industry that are sourced from imported materials. This then affected the level of local component requirement (TKDN) of Indonesian automotive products. With so many imported materials, making pure TKDN or "true localization" is not as high as expected. To be able to play an active role in combating the imbalance balance of trade in the automotive component sector, as well as contributing to the achievement of high pure TKDN, TMMIN and its related stakeholders are making efforts to localize raw materials for automotive manufacturing industries, which is summarized in the "True Localization" program. Since 2004, TMMIN has used local steel for certain vehicle parts. In 2017, two types of raw materials, resin is in collaboration with PT Chandra Asri Petrochemical Tbk (CAP), and non-woven fabric is in collaboration with PT Herculon Carpet, have been localized, after previously in 2016, working with PT Pertamina, localize the lubricant engine oil. TMMIN is currently in the process of researching and developing the use of local aluminum to be used on wheel discs in collaboration with INALUM and Pako. TKDN of Toyota brand products now stands at 75% - 94% with pure TKDN at 65%. Toyota targets to be able to reach pure TKDN/ true localization at 80% by 2020. In the period of January-October 2018, Toyota Indonesia recorded car export in completely built-up (CBU) units for up to 173,700.When compared to the same period of the previous year (January-October 2017), this result remained positive, up 2%, from 170,400 units. Toyota Indonesia still strives to maintain its positive trend ⎯even though global economic conditions, especially export destination countries, are still unstable. TMMIN's President Director said that some of Indonesia's traditional export destinations still experiences economic recession. This condition is used by Toyota Indonesia to maintain global production efficiency and quality, so that it remains competitive with other countries. "Competitiveness is the key. As long as Toyota Indonesia and the entire supply chain can improve while still prioritizing quality, including using as much local material as possible, our production will be more competitive and well absorbed by export destination countries, "said Warih. From the achievement of positive exports of Toyota Indonesia, the Fortuner is still the main support with the contribution of 43,400 units or covering 25% of the total CBU shipments under the Toyota brand. The second position is occupied by Avanza with a result of 30,700 units (18%), then Agya with 27,200 units (16%). In the fourth rank, is the latest generation Rush with 25,600 units (15%). Vios, that happens to be the only sedan produced in Indonesia, closes the top five positions and managed to become primadona with a contribution of 20,300 units. Although this small sedan is not a primadona in the domestic market, Vios's production and export performance prove how much Toyota has committed in Indonesia. In addition to car exports in CBU conditions, Toyota Indonesia also delivered a completely knocked down (CKD) form. For the same period, there were 35,500 CKD cars sent from the Karawang factory, West Java. As part of the global supply chain, Toyota Indonesia also exports motorized vehicle components, with a total of 81.9 million units. This does not include engine assy, which is 37,300 TR type units and 87,800 RNR type units. Bob Azam, Director of TMMIN, added that the consistency and success of the export of the Toyota brand from Indonesia shows that Indonesia's position is very strategic for Toyota's global network.